Lythwood Lodge - Lidgetton Accommodation. Are you looking for a conference venue where all the delegates will be away from the countless distractions in the city and at the office? A place where they can really connect and build strong relationships. Lythwood is the perfect team building and conference venue. Luxury country accommodation, just one and a half hours from Durban and five hours from Johannesburg. Sometimes you just need a break. A change of scenery. A respite from the hustle and bustle of everyday life. Time to clear your head, gain a fresh perspective, recharge. Bond a little with family and friends. 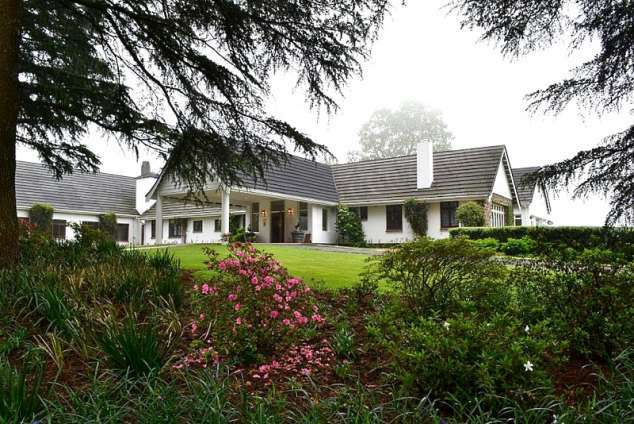 Lythwood – a 4-Star boutique country hotel estate nestled in the KwaZulu-Natal Midlands. Far enough away, for you to feel as if you’ve left it all behind. Close enough for a weekend away or a quick mid-week break. Tucked away in the middle of farmlands and forest right on the KZN Midlands Meander. A place where you and your loved ones can relax, have fun and make memories. Big trees, open lawns, beautiful gardens. Natural forests and rolling hills. Pastures with cattle grazing lazily. Small game also make an appearance. Fresh air and wide open spaces. Occasionally, we are shrouded in mist, giving you that otherworldly English Countryside feel. Combine this relaxing country environment with the beautiful boutique hotel bedrooms, our meadow rooms, or our fully equipped family cottages and you have the perfect mix. Warm fireplaces and comfortable lounges to take tea and play board games or simply enjoy a riveting novel while we wait on you hand and foot. And if the mood grabs you, you can lie on your bed and watch whatever takes your fancy on our selection of DSTV channels. There is something special about the KwaZulu-Natal Midlands, waiting for you to discover. Lythwood is close to golfing, mountain-biking, walking and hiking trails and other family friendly activities. If it’s swinging from the trees at the famous Karkloof Canopy Tours, or fishing for that elusive Trout, we have it all, just a hop-skip and a jump away. Want to go shopping or try out the local cuisine? Lythwood is situated right along the popular KZN Midlands Meander. There are all kinds of special and unique arts, crafts and wares to be discovered. Here at Lythwood, our Khaya Centre venue can accommodate up to 250 people. But we also have the facilities to set up a smaller, more intimate events if that is what you are looking for. Indoor or outdoor wedding? Our rustic chapel, Bedouin tent or 275-acre estate are yours. Want family and friends close? We have 33 rooms available. Romantic Lythwood in the mystical mountains of the KwaZulu-Natal Midlands is the ideal setting for that extra special weekend-away wedding. Whether it’s a romantic garden ceremony, a ceremony in a rustic country Chapel or under a Bedouin tent you are dreaming of, we have all the options. Same goes for your reception… under the stars or covered. Having a great venue, that cooks delicious food, has a spacious conference hall, Bedouin style outdoor tent, break-away rooms and luxury accommodation – for you to host everything from smaller executive strategy sessions, conferences, team-building opportunities (think mountain biking, fishing, and the Karkloof Canopy Tours, amongst others) to larger trade shows and exhibitions – and gives you top-notch service is par for the course. It’s what you expect from an award-winning conference venue. At Lythwood, you can expect us to get all those details right. When you appoint Lythwood as your conference venue, pick up the phone or email us and you can consider it done. We’ve laboured long and hard to make sure you don’t have to. You can be sure you’ll have everything at your fingertips to help you plan a successful conference, that meets your objectives. The Lythwood Conference Venue is situated along the peaceful Kwazulu-Natal Midlands meander. Just one and a half hours from Durban and five hours from Johannesburg. Perfect! Four comprehensive wedding packages, each including various wedding service items relating to your wedding with a single all-in price. Some include things many other venues don’t, like accommodation for your guests, your wedding cake, and more. Include a dedicated wedding co-ordinator, to make planning your wedding a breeze! Prefer something more intimate or a superb reception. The choices are endless. We are a Level 1 Contributer please download our certificate here. Do we serve Halal Food? Yes. Lythwood serves Halaal certified meals, all you need to do is let us know your specific requirements beforehand. After a long day of meandering or conferencing, unwind in front of an open fire in the bar or on the patio while watching Reedbuck and Duiker frolic on the open lawns. The bar was used in the first Spud movie as John Cleese’s office. Then move into our restaurant where the Table d’hote menus are drawn up daily by our head chef, Vusi Mkhwanazi. It is seldom that one gets the opportunity these days to relax, slow down and enjoy special company, while enjoying a 5 course dinner. Through redesigning the menu daily, Vusi can ensure the freshest and best quality produce from around the Midlands. The setting of the restaurant is as varied as the cuisine Vusi offers. The restaurant staff will often take the restaurant outside where dinner can be enjoyed under an ancient oak tree and the twinkling stars of the night sky. The restaurant is always open to guests staying at Lythwood Lodge. Non-residents are welcome to come and enjoy Vusi’s great fare but bookings are essential. 809 page views since 23 Jul, 2018. Last updated on 26 Jul, 2018.